The State paid €15.8m in rent and service costs for the new headquarters for the Department of Health from December 2016, but the building remained unoccupied up to April 2018, according to the latest report of the State's financial watchdog. The Comptroller and Auditor General report for 2017 states that Miesian Plaza, the former Bank of Ireland Headquarters in Dublin - was identified as "virtually the only option" - and there was no evidence of detailed consideration of other options when a new premises for the Department of Health was being sought. No cost-effectiveness analysis or economic appraisal was carried out, with no consideration of other lease, buy or build options. There was also no evidence that the full costs of leasing Miesian Plaza were identified and evaluated, including fit out, operating and maintenance costs, furniture, VAT, or the cost of Office of Public Works staff involved in the project. In addition, the risks associated with the project were not set out, such as issues with agreeing client departments' accommodation needs, and the effect on a practical completion date. The OPW said two alternative premises including the former Central Bank premises on Dame Street were rejected. 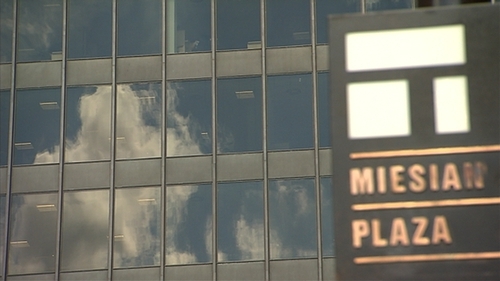 The annual rent for Miesian Plaza was to be almost €10m (€9,267,000). However, had the building been measured in accordance with international standards rather than on the bases of "net internal floor area", the rent would have been €344,000 lower. As there are no break options in the lease, additional rental costs could amount to between €9.5m and €10.5m (including VAT) over the 25 year term of the lease. The C&AG said it was unclear why the rent per square meter was not reduced proportionately. The OPW said it was engaging with the landlord with a view to rectifying the matter. The C&AG also notes that no rent free period or break option is included in the Miesian Plaza lease, nor is there evidence of an appraisal of the reasonableness of the rent agreed considering the absence of a rent-free period and lease break option. The OPW said a rent-free period and a break clause were traded for a lower initial rent. The OPW also noted that given the level of investment in fit-out and the rental price achieved in a rising market, a break at year 10 would not have been beneficial. The Comptroller and Auditor General found similar issues when it reviewed a 20-year lease for a different premises in Galway. The C&AG found that there are significant weaknesses in the Health Service Executive system to monitor the level of private patient activity in acute public hospitals. The HSE received €305m in 2017 from private patient charges. Further private patient income was received directly by HSE-funded section 38 hospitals. Overall, the HSE seeks to limit private treatment activity in Irish public hospitals to 20%. private activity levels as the majority of patients admitted to hospital are maternity admissions or admitted from the hospitals' emergency departments. In July 2017, the Secretary General of the Department of Health wrote to the HSE director general citing concerns that consultants may be exceeding their permitted level of private practice within the public hospital system and may be exceeding their off-site private practice rights or engaging in off-site private practice while being employed under a contract that does not permit any off-site private practice.